Kodiak Building Inc. is a full service construction company. Our projects include home building, remodeling, repair and custom design. We are located in Beaverton, OR. and serve the surrounding area. We provide construction related services from concept to completion. Our scope of work includes large projects as well as small jobs. We can provide a design for a functional floor plan with an aesthetic integration to your existing residence or building site; or we can repair your deck and make it safe. We have over thirty years experience in the construction industry, which enables us to give the client realistic expectations on crucial items such as feasibility, scheduling, and budget. Our people are skilled and knowledgeable in their craft. We have a crew of exceptional full time employees and strong relationships with sub-contractors, engineers, designers and suppliers. We believe this group of people to be the best in the business. Our team is considerate and respectful of the home owner. Our goal is to make the project exceed your expectations; on all levels; except that of costs. There are two themes consistent in our work. The first is safety; which is always our first priority. Workers and subs are never hurried or pushed with unrealistic timelines. Scheduling is methodical and stress free. Most new projects are referrals. This is the “yardstick” from which we measure customer satisfaction. Kodiak is an environmentally conscious company. Responsible building is essential and includes proper land use, work which goes beyond the “required minimum”, recycling and re-claiming, the use of “green” energy efficient products and buying locally. There is no fee for initial consultation. So tell us about your ideas and let us show you some of our work. We want you to be part of our ever growing family of satisfied customers. Please enter the numbers or letters below. 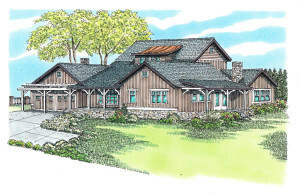 We purchased our dream home that was designed and built by Dan and Kodiak construction. After looking at over 50 other houses we knew that we made the right choice. The quality of construction, materials and attention to detail far exceeds that of other builders. Even our home inspector was impressed by the quality of construction and workmanship. Dan has contacted us several times to make sure we are happy with the house and there are no imperfections. They definitely stand behind their product. After purchasing the home from Kodiak, we hired Dan and his team to do a couple other jobs, and they are professional, courteous and timely. We are excited to watch Dan and Kodiak build the other homes around us. We highly recommend Dan and Kodiak Construction. You will not find a better builder or person. The work was completed well ahead of my deadline even with the addition of two major and several minor projects. It's rare to find a contractor with such creative and aesthetic solutions to design challenges. Impressed with the skill and carefulness of the workers and the quality of the work. Dan listens, he is involved and has a sense of fairness and humor, as well as a great dog! I would recommend Kodiak Building, Inc. enthusiastically and unconditionally. Dan and his professional crew have helped us recreate our home over a seven year period. Dan has tackled almost every aspect of design and implementation on our home. Our home is a combination of 1940's through 1970's design and construction which has required Dan to use imaginative approaches to accomplish many of the tasks and our dreams that we have requested of him. We have never been disappointed with his exceptional work. We have called Kodiak Builders back many times over the years for new projects or additional enhancements of the property. Since our home is 40 to 60 years old, Dan has been called upon to be creative and imaginative when encountering the uniqueness of early construction. Dan's gracious attitude, attention to detail and work ethic set him apart from other builders. Dan has often completed the work ahead of schedule and for less than the projected costs for the project. He has always given us more than we expected. Please feel free to contact us for further information regarding this testimonial. Dan took on the challenge of working long distance at our beach front property in Seaside, OR. Knowing that the weather and the availability of subcontractors can always pose a challenge, I was pleasantly surprised to find that the job was done on time and on budget. Dan has a keen eye for detail, and the quality of his workmanship is second to none. Now that the coastal property is done, we're hoping to start an addition on our home in Portland, OR in the next few months. The only person I want in charge of and handling that job is Dan. We want to thank Kodiak Building for the wonderful job they did on our complete kitchen remodel and addition. We are so pleased with the result! The work Dan, his crew, and subcontractors did was excellent. We were especially impressed with the time frame in which the job was completed - they stayed on schedule and delivered on what was promised - with the minimum amount of disruption to our household. We would definitely recommend Kodiak to anyone, and will use them again in the future. © 2019 Kodiak Building. All Rights Reserved.